It is a little crest like a little star like…and it is uses the easy triangle format that I am a little addicted to at the moment. This free 8 inch pattern involves only 28 pieces and you can down load the PDF here…Sharp Star. I really like what you do, but have to bow out of the struggle to paper piece and go back to my old ways, after the weekend disaster! Oh no…what happened? I hope it was not too traumatic Viv. and the points were all wonky. I really love this pattern. 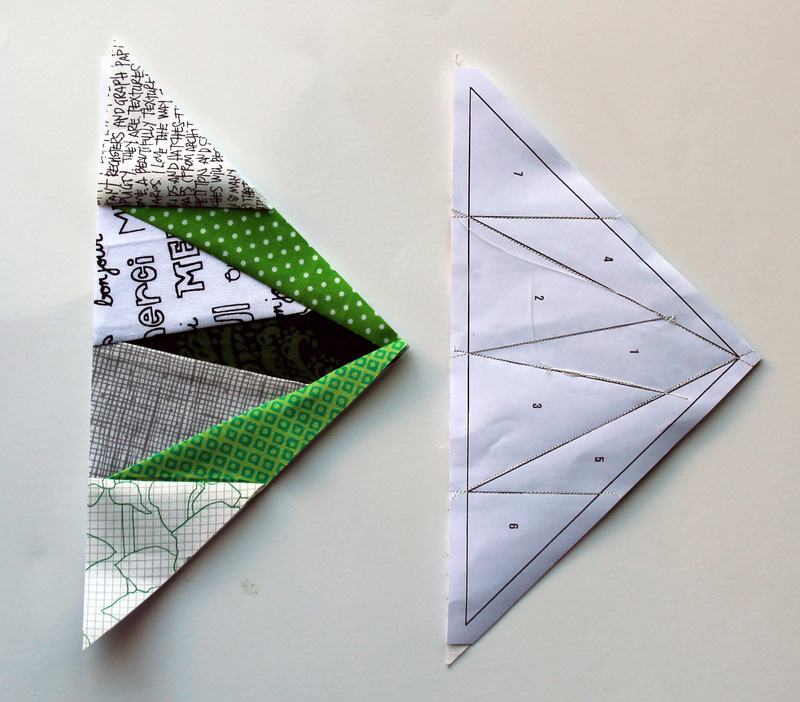 Maybe I’ll have to give paper piecing a try. I need some setting triangles. might be able to adapt this for that use. Thanks for posting! How many of these green and spiky lovelies do you have now? It must be getting on for enough for a quilt, surely? I will get back to paper piecing one day, but first I have to clear my UFO/WIP list a little. How to you handle all the layers of fabric in the middle when you join the pieces? So much bulk there isn’t there? Diane this block was not too hard as there are only 4 pieces of fabric meeting in the middle, but some of the blocks I have done have been ridiculously bulky. When sewing bulky blocks together I remove as much of the paper from the center of the block as I can without loosing the sewing lines…this helps keep the middle bulk down, ensures tighter stitches and means you are not trying to pull little bits of paper out of small spaces when the block is all done. I must admit I have learnt to accept that bulky centers are part of some of these star blocks and work with it. If I am quilting the top myself I will sew through the center pieces of my stars as much as the design allows. I have found that the quilting process helps control and soften the bulk. The washing process also helps. 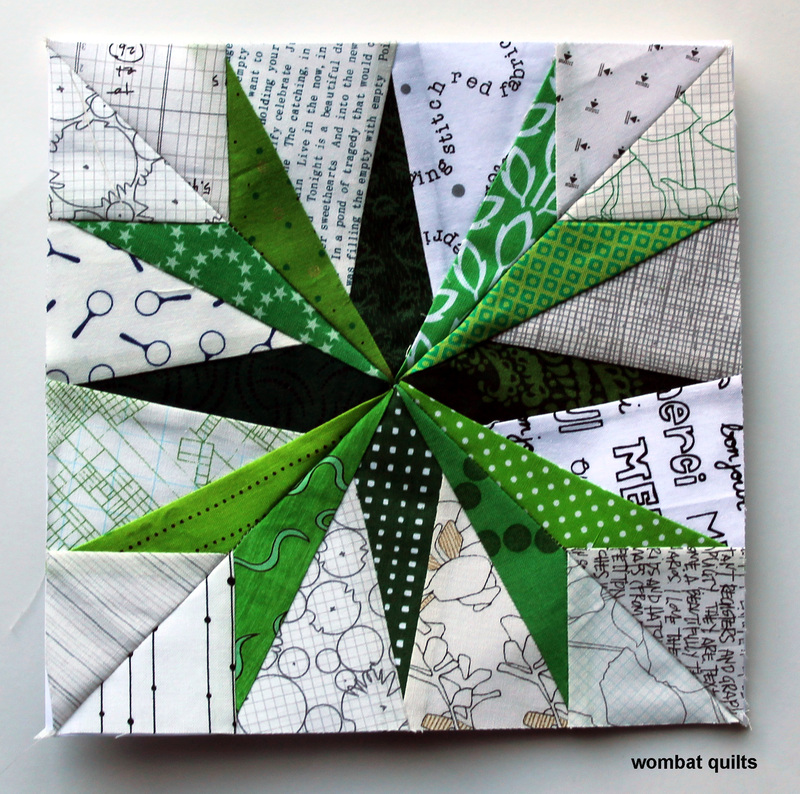 I have one paper piecing project that I started years ago….I really need to get back to it! I LOVE it! Thank you so much for sharing and providing inspiration.